A 1928 home in Ashland Place Historic District. Ashland Place was one of the most successful of the subdivisions that expanded the city’s boundaries during the 1920’s. 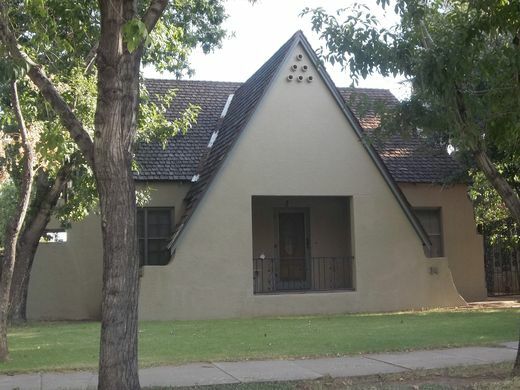 While most of the other historic residential areas were built by multiple developers, contractors or private investors, Ashland Place was largely the product of Home Builders, Inc., one of the biggest and most prolific residential development companies in Phoenix in the early 20th Century. Home Builders, Inc. was organized in February 1910 under the management of R.H. Greene and in association with the real estate firm of Greene and Griffin. 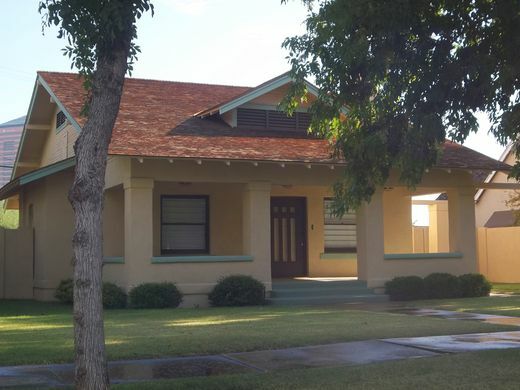 The company was responsible for the construction and marketing of over 800 homes in Central and North Central Phoenix before its liquidation in 1939. A key to their success was the use of an affordable, time payment plan for the purchase of residential lots and the construction of homes. This was a fairly innovative concept for the time. It brought national exposure to Home Builders, Inc. when a cover story of the National Real Estate Journal was published in 1924 about the company’s development, construction and financing methods. Like the other subdivisions undertaken by Home Builders, Inc. at that time, the initial construction was Bungalow-style houses. In 1924, the company retained C. Lewis Kelley, an architect from Hollywood, California, and their construction began to diversify into other architectural styles. Fourteen homes were added to the subdivision over the next two years, primarily picturesque Tudor Revival and Spanish Eclectic cottages, styles popularized by Kelley. The tract was heavily promoted by Home Builders, Inc. as part of their “specialty of building for folks of moderate means.” The early residents of Ashland Place reflect this emphasis with occupations generally of the middle class: salesman, bank teller, pharmacist, teacher, bookkeeper, tailor and engineer. The promotion of the subdivision was very successful. By 1931, only four vacant lots remained. The success of the Ashland Place Historic subdivision apparently prompted land owners to the north to subdivide their property for residential development. In 1924, A.F. and Ella Jones and Angus and Ella Douglas platted the North Ashland subdivision. The new subdivision consisted of 11 lots along the north side of a new street, Ashland Avenue, extending west from Central Avenue. The south side of the street was not subdivided. An article from the Arizona Republican dated March 13, 1927, titled “Trio of North Ashland Homes are Completed” shows a photo of three homes in the North Ashland subdivision. The articles states that they are “the first three of a group of nine homes to be built on Ashland Avenue,” in the North Ashland subdivision, which was a “continuation of Ashland Place.” The homes, which were built by the A.F. Wasielewski Construction Company, were similar in style, size and price to those in the offered in the Ashland Place subdivision. Development to the north of Ashland Place continued when the Woodward Place subdivision was platted in 1929. Platted by the Phoenix Title & Trust Company, the subdivision consisted of 21 lots along Woodward Drive, which curved north from Central Avenue to Virginia Avenue. As the Great Depression took hold in the early 1930’s, building activity ceased. By the late 1930’s, recovery was underway and over 50 new subdivisions had been platted. The Ashland Park subdivision was platted in 1936 by Ella Jones, Ervin and Christa Atkerson, and the North Central Investment Company. Ashland Park consisted of 10 lots, five of which were created from the earlier North Ashland subdivision. The other five lots were located on the south side of Ashland Avenue, which had not been subdivided previously. The majority of homes on the west half of Ashland Avenue appear to have been built during the late 1930’s as part of the Ashland Park subdivision. In 1937, the Monterey subdivision was platted, connecting Ashland Avenue to 3rd Street. The subdivision, which was platted by Erwin and Christa Atkerson and Blaine and Edith Alexander, had a unique layout with a one-way oblong loop road around a large island which became the focal point of Ashland Avenue. Development of the subdivision began in the fall of 1937. The unique aspect of the tract’s development was that it was entirely owned and built up by the Church of Jesus Christ of Latter-Day Saints (LDS). The LDS Third Ward Chapel, built in 1938-1939, became the centerpiece of the 11-lot subdivision. The building, which was designed by Alexander & Burton, is exemplary of the Period Revival Architecture of the late 1930’s, combining elements of American Colonial architecture with Italian Renaissance to provide eclectic imagery. The remaining 10 lots facing Ashland Avenue were intended for the residences of church officers and members and were also designed by Alexander & Burton. The first house completed was that of Bishop David Stohl, located at 78 East Ashland. The remaining residences were built between 1938 and 1940. Most of the homes in the Woodward Place subdivision were also built during the late 1930’s. Although little is known about the designers or builders of these homes, it is evident that they were similar in style, size and price to those in the Ashland Park and Monterey subdivisions to the south. It should also be noted that one of the homes on Ashland Avenue, the Parker L. Woodman House at 11 East Ashland, predates all of the subdivisions outlined above. Built in 1911, the Woodman House is significant as the only remaining house on a residential lot facing Central Avenue between McDowell and Thomas Roads. Although it is no longer visible from Central Avenue because of commercial development, it is still a significant example of the large homes built along the street during the early 20th Century. It is also an excellent illustration of the Colonial Revival style with a high degree of detailing including classical veranda columns, Palladian window, denticulated eaves, and use of materials including brick, pebble dash stucco and wood shingles. The home was built for local rancher Parker L. Woodman, who occupied it from 1915 until 1920.